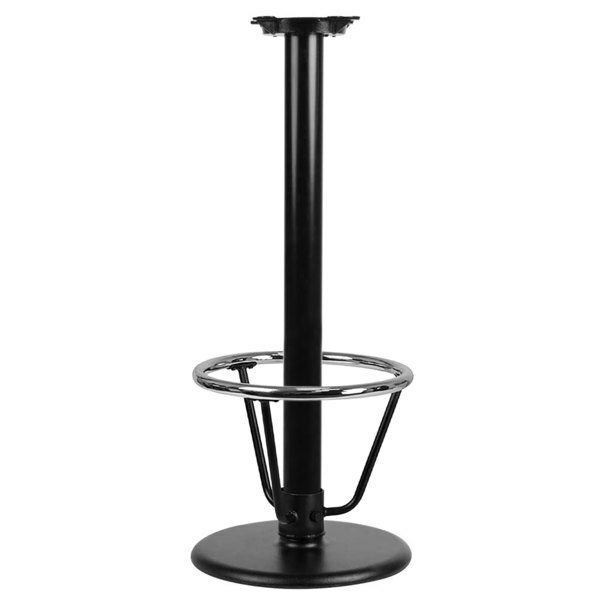 Perfect for virtually any environment, this Lancaster Table & Seating 17" round black 3" bar height column table base is a sturdy, reliable, and attractive choice for your operation. Made of black powder-coated cast iron, the base even comes standard with everything you need, but the table top! A round base plate helps steady the 3" diameter, bar height column, while the table base spider secures your table top to the base. The bar height design makes it great for not only bars, but cafes and other casual sitting areas. To ensure optimal comfort, this particular table base features a chrome foot rest. It serves as a place for guests to rest their feet, helping them to relax at the end of the day and enjoy their favorite drinks or cocktails.